The conventional wisdom suggests that seeds will grow as soon as they get a little water. These results suggest they need more than that. The key is seed dormancy. Seeds have multiple physical and chemical mechanisms that act as barriers to germination. Seeds with no barriers to germination could germinate inside the mother plant, which would not be good for the species’ long term survival. Seeds that need only moisture to germinate, could start to grow after a July thunderstorm then die in the August heat. Species have evolved these mechanisms in order to germinate at the right time every year. The mechanisms are different for each species. Seeds are exposed to sun, heat, cold, drying, dew, thunderstorms, soil chemicals, and soil organisms during the summer and fall. These stresses appear to break down these barriers. Finally, when the season is right, the last of the barriers breaks down and the seeds begin their new life. The need for seeds to break through these barriers explains why seeds sown well before the summer rains produced better blooms than ones sown in November. It also explains the stunted, late blooming wildflowers produced by seeds sown in October. These seeds had not broken down all of their barriers before cool rainy weather would normally trigger them to germinate. This weather caused the seeds to break down what would have been their last barrier, but other barriers still remained. Some seeds managed to break through these other barriers, but that took extra time. As a result, these plants had too little time to grow to their normal size before warming weather triggered them to produce flowers and seeds. 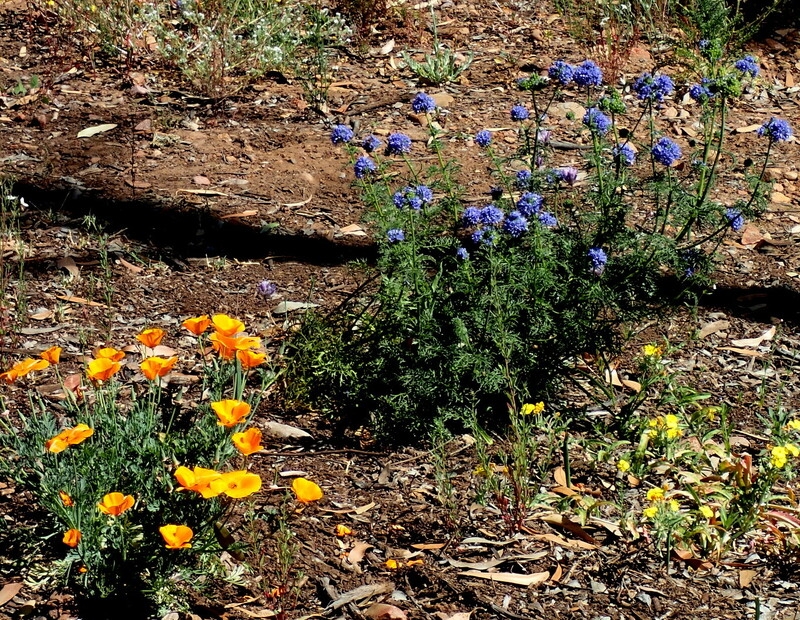 Suppression of wildflowers that were covered with soil was surprising. However, we know that disturbing soil can uncover seeds that had lain dormant for years. While buried seeds stay dormant, they germinate when exposed to the surface. Perhaps covering seeds with a thin layer of soil makes them feel like they are buried. We think that covering seeds with a thin layer of soil protects them from small animals. But birds scuffle the soil, working hard to hunt buried seeds. I think we may be fooling ourselves but not the birds when we cover seeds with soil. Consider also that most annual wildflowers sow their seeds in the spring, long before their growing season. Seeds sit on the ground, unburied, and somehow enough survive predation to produce vibrant displays, year in, year out. These tests certainly challenge conventional wisdom, but they are too few to be definitive. We need more tests like this to get a better understanding. The most valuable tests will be the ones that enable us to compare our methods. Much of what we hear about growing wildflowers is anecdotal. Most gardeners grow wildflowers in a particular way, and they explain their results based on their intuition. What we do not know is what would have happened if the something were changed. Would the results have been better or worse? The good news is that tests like this are easy to do as long as you have a suitable area. Sow seeds in one place the way you think is best and sow them in another by changing something. Think of your preferred method as a scientific control and your hypothesis is that this is the best way to do it. Changing something introduces a variable, and when wildflowers grow, you will learn how the variable affects your results. Keep notes and be sure to share what works best with the rest of us. A better understanding of how wildflowers grow will pay dividends in beauty! Download a more detailed report of these experiments and their results here. Lee Gordon has a PhD in Oceanography and has a profound interest in the germination and propagation of native plants. A problematic weed infested brush management zone next to his home became an opportunity to reestablish attractive native plants including trees, shrubs, perennials and annuals which lead Lee to research the best methods for propagating local indigenous plants. Lee has discovered how to propagate Mission Manzanita from seed, which Lee grows for the CNPS-SD Chapter plant sale and restoration projects. Lee also has a project under the auspices of the City of San Diego to study methods to increase populations of the San Diego Willowy Mint, a rare and endangered species. You can read a Fremontia article co-written by Lee titled “Mission Manzanita, Queen of the Elfin Forest: Is the species in decline?” at this link. This entry was posted in Gardening Tips, Propagation, Seasonal Gardening. Bookmark the permalink. This is cool information. I hope this challenges our assumptions and that gardeners check this out and give some good feedback on results. Very informative article, Lee. I love the research that went into it, and the findings are very surprising. I hope you, Debbie, and your lovely garden are doing well.